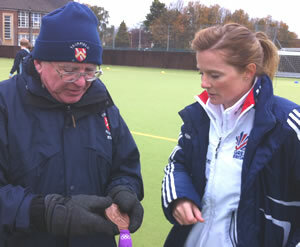 We had a brilliant Junior Hockey day run by Bob and our fantastic team of coaches and assistants on Sunday 28th October. I did a quick head count and there were well over 200 people present, all having a great time. I really want to thank all of you who were involved, either running events, working at the gate, making lunch, or just there as a Club supporter, it was a truly fantastic Club effort. Helen Richardson and Kate Walsh joined us, originally to join in with a number of the events, but I soon realised that the youngsters had different ideas, so stick signing, autographs, photos and Olympic Medal "weighing" became the order of the day. 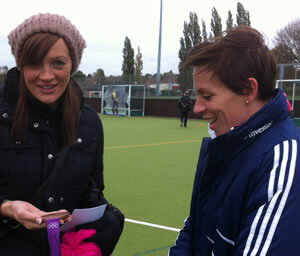 Helen and Kate were absolutely fanatastic with the youngsters, and the "starry eyed" adults! Both Helen and Kate were amazed at the success of the event, and the brilliant work that we are doing. "We both had a such a great time and I was so very proud to see all the good work you and everyone at the club are doing. I can't imagine there is any club in the whole country doing a better job! I'm glad everyone had a good day, apologies for having to rush off but at least I'll have those two days in April where we'll be able to catch up properly." (email from Helen to Bob). Afterwards we adjourned to the Clubhouse to warm up, have a light lunch and make a few presentations, with one lucky lad winning Helens' training top. Helen and Kate then left to catch a train, with some flowers, some bubbly and a warm glow from our unique Bridgford hospitality and our heartfelt gratitude. I cannot really tell you how nice they were, or the impact the day made on so many youngsters - remarkable. So, thank you to all involved, get out your diaries and pencil in the 27th April which is Bobs special 25th anniversay of his Junior Development master plan which has been pivotal in our growth to become one of the best Clubs in the Country. We are going to have a brilliant celebration with many friends old and new joining us - including Helen and Kate who I hope will also be joining us at the Dinner Dance that same evening. Can't wait. Did you find that in a Nightclub Jonesy?